Our goal is to provide affordable, high quality, early educational child care in a stable and nurturing environment, thereby providing the children of working families skills and hope for lifelong development. 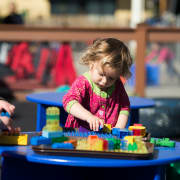 Holy Family Day Home is one of San Francisco's oldest preschools, serving low income and homeless Bay Area families with affordable early childhood education and family support services for 117 years. We serve 154 children, ages three months to five years, and their families. We are a San Francisco institution that sees over 200 daily who are looking to maintain stable, healthy lives while their children gain skills for lifelong development through progressive education. Although founded by the Sisters of the Holy Family, Holy Family Day Home is a non-denominational program. Would you recommend Holy Family Day Home?